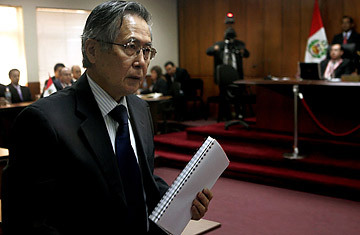 Alberto Fujimori was nothing if not hands-on during his decade as President of Peru. In January 1997, in the midst of the hostage ordeal at the Japanese embassy in Lima that dragged on for four months, "Fuji," as Peruvians called him, took TIME on a ride around the capital in his Toyota 4x4. His aim was to demonstrate that he, not the Tupac Amaru guerrillas who were holding 72 civilians (including Fujimori's brother) at the embassy residence, who enjoyed the support of the country's poor. At one shantytown he rolled down his window and basked in the thank-yous for the new streets and microbuses. One woman called out, "Fuji, the new water pumps you gave us aren't working!" Ever the engineer, Fujimori shot back, "Do you have the pressure set right?" He opened the Toyota's door and was about to step out until he stopped, as if remembering that he was a President, not a plumber. But Fujimori clearly wanted to fix that woman's water pump. Fujimori insists he's innocent, and his attorneys announced his intention to appeal. In his impassioned testimony last week, he said of the tribunal, "From an ice cube they have tried to find an iceberg." Human rights watchdogs, however, say the evidence presented at Fujimori's 16-month trial, held on a police base with judges presiding, is more likely the tip of the iceberg of abuse that occurred during the early years of Fujimori's authoritarian rule. The abuses "were committed as part of a broad, systematic policy of executions and forced disappearances that [Fujimori] ordered and carried out through intelligence services," charges Maria McFarland, a senior researcher at Human Rights Watch, based in New York City, who has followed the case from the start. "These cases are a 'for example' of what happened, which is not only a message to the families in these cases but all cases." The tragic irony is that it was Fujimori's attention to detail that helped make him one of Latin America's most popular leaders of the late 20th century. The son of Japanese immigrants, he emerged out of left field to win the 1990 election and take over a country of 28 million people that was adrift and under siege by Marxist guerrillas. Its annual inflation rate was near 7,600%, and insurgents had three quarters of the country under a state of emergency. Fujimori quickly tackled the hyperinflation, and in 1992 his security forces arrested Shining Path leader Abimael Guzman in a counterinsurgency war that saw more than 70,000 Peruvians disappeared or killed between 1990 and 2000. Fujimori scored social triumphs as well, including granting land titles to urban squatters that made hundreds of thousands of Peruvians homeowners and participants in the formal economy. Tuesday's verdict, say human rights watchdogs, is a warning to authoritarian leaders everywhere that the age of impunity has passed. And when human rights records are scrutinized, water pumps and new streets are not the basis on which caudillo leaders will be judged.